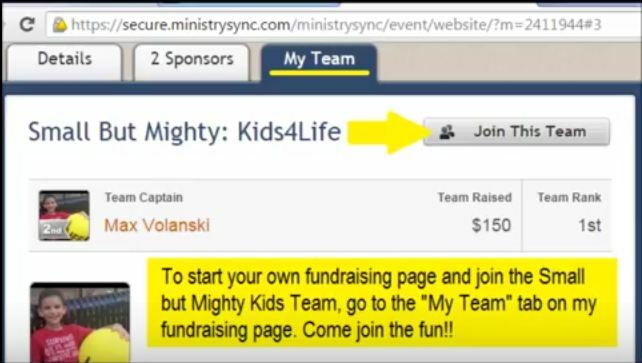 Earlier this year, I introduced readers to a special little boy who wanted to raise funds to help the pro-life cause. His name is Max and at the age of 5 years-old he began praying in front of Planned Parenthood for the babies and their mom’s. 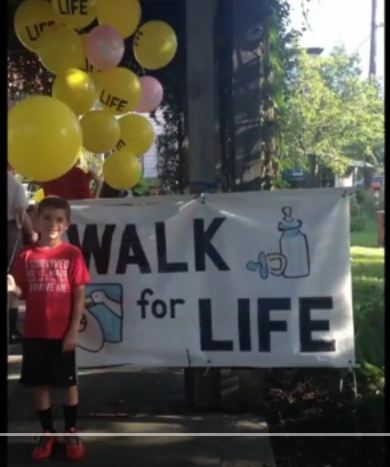 Last year, Max decided to walk for life where he says he was able to raise almost $2000.00 to help moms choose life through Houston Coalition for Life’s mobile crisis pregnancy center. Now, at 9 years-old, Max is reaching out again. Max is walking again this year to raise money — this time his goal is $10,000 for Houston Coalition for Life’s Big Blue Bus. 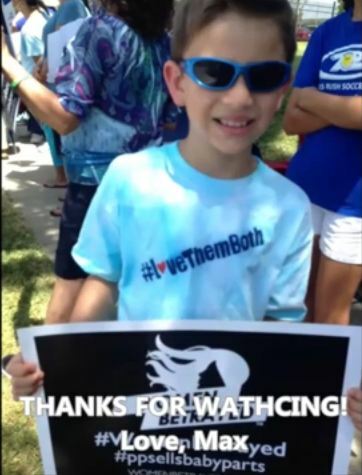 Max’s mom told Saynsumthn that Max is very concerned for the babies and women and now that the Houston Planned Parenthood abortion mega center has been exposed participating in the grisly baby parts harvesting operation, Max is even more determined to help. 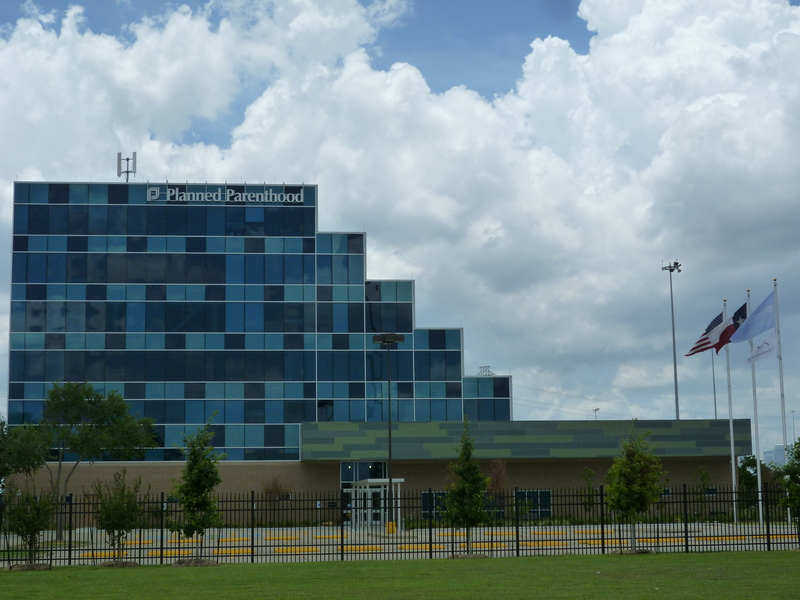 “The Big Blue bus sits on the street just outside the largest abortion facility in the Western Hemisphere, Planned Parenthood Gulf Coast,” Max tells his supporters in his video. 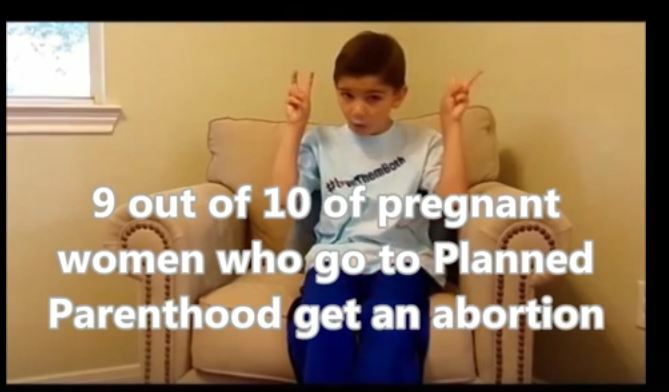 “Think about this, 9 out of 10 pregnant women who go to Planned Parenthood for “help” get an abortion,” he says. In contrast Max points out that 9 out of 10 pregnant women who enter the Pro-life Big Blue Bus continue with their pregnancy. He said Houston Coalition for Life helped over 1000 women choose life last year outside the abortion behemoth. The sweet sacrificial 9 year-old marketer suggests that everyone post his video on Twitter and Facebook and e-mail it to all your friends to help Max meet his $10,000 goal. “It’s really great knowing you helped moms and babies,” Max says. If you are interested in helping Max with his effort, click his fundraising page here. 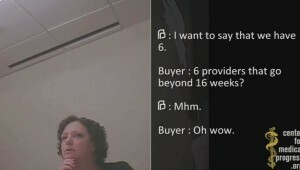 Another amazing find from Operation Rescue shows the absolute bias that will be used in any investigation of a Planned Parenthood which is part of an alleged illegal baby parts harvesting operation. 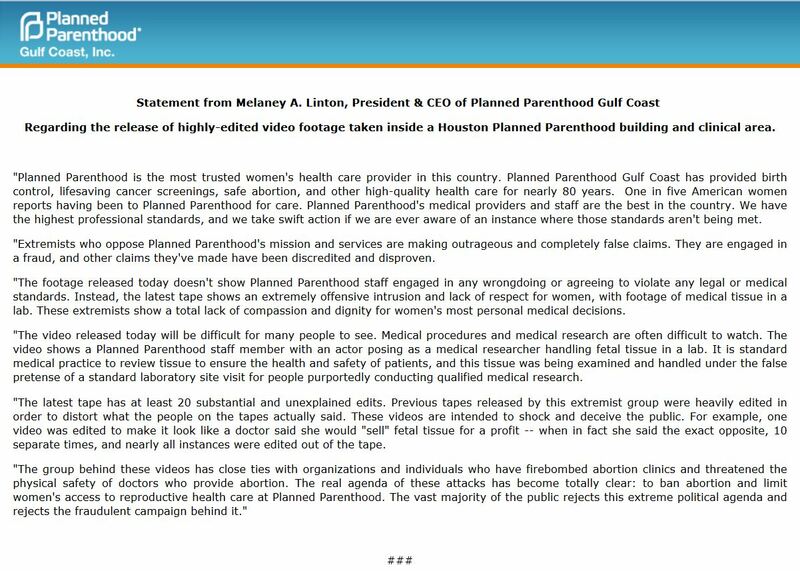 It has been learned that a prosecutor in the Harris County District Attorney’s office that is currently investigating a Houston Planned Parenthood abortion clinic for selling aborted baby parts, serves on the Board of Directors for Planned Parenthood. 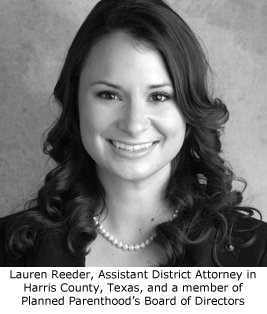 In a statement released Friday, Harris County District Attorney Devon Anderson said one of her assistant district attorneys disclosed that she is member of the Gulf Coast agency’s board of directors. “She made the disclosure in order to be transparent,” Anderson said in the release. She added that she remained confident her office could conduct an “unbiased, fact driven investigation” of the allegations. 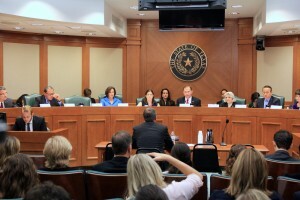 Anderson told the Houston Chronicle that Reeder would not be involved in the PPGC investigation. 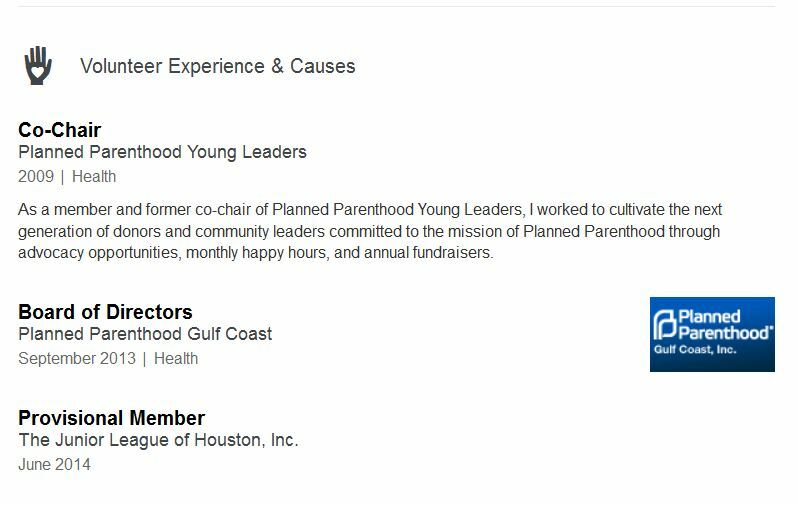 As a member and former co-chair of Planned Parenthood Young Leaders, I worked to cultivate the next generation of donors and community leaders committed to the mission of Planned Parenthood through advocacy opportunities, monthly happy hours, and annual fundraisers. 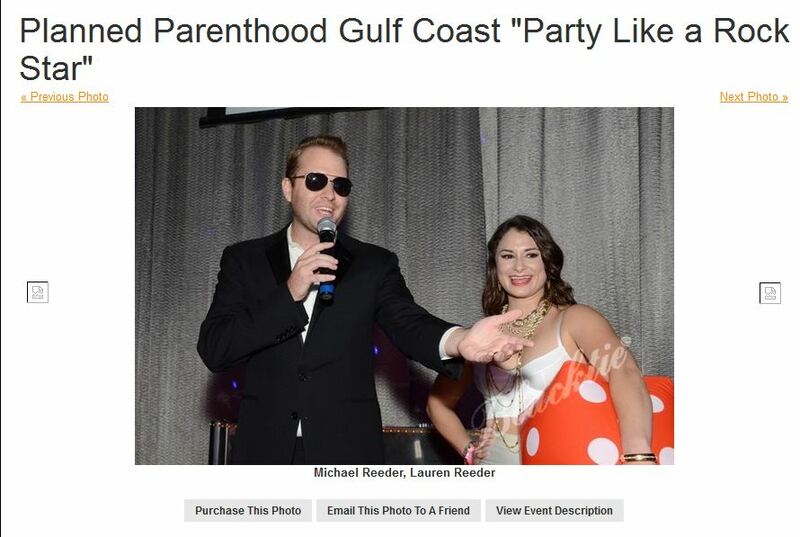 An image captured by PaperCity shows Reeder at the Planned Parenthood event. She also chaired another Planned Parenthood event called Cocktails for a Cause and featuring Sandra Fluke. 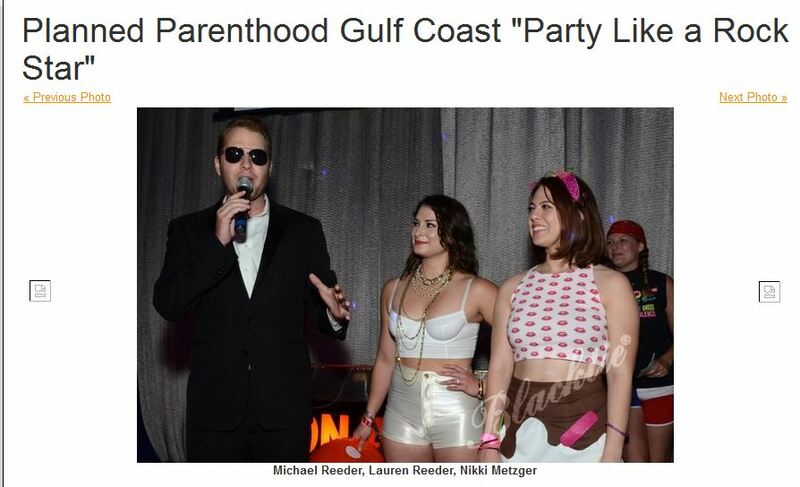 According to the Houston Chronicle, Lauren Reeder contributed $925.00 to Planned Parenthood Gulf Coast Inc. Fund Action PAC. “Our organization has been doing research for many many many years,” Farrell tells CMP. At issue is whether Planned Parenthood is violating federal law in selling aborted baby body parts and altering the abortion procedures to do so. 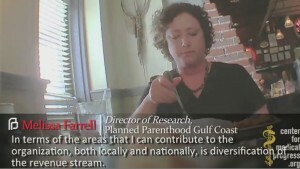 “We deviate from our standard to do that,” Planned Parenthood’s Director of Research says in the video. Asked if Planned Parenthood can alter or adjust the procedure to get the specific organ or tissue needed, the Planned Parenthood employee repeatedly replies yes. 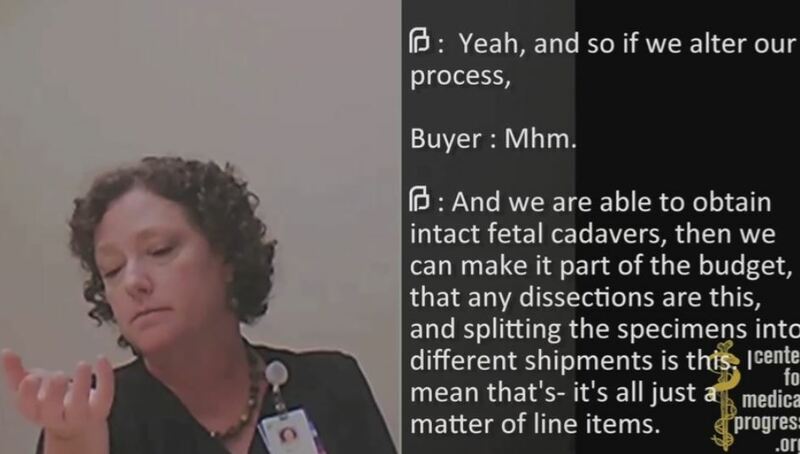 Even agreeing to 18-20 week “specimens” that are “intact‘ meaning babies that are delivered or aborted whole. 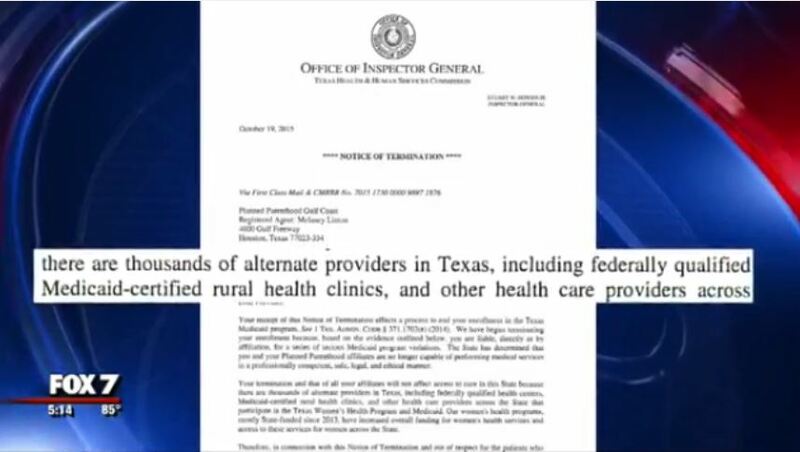 The Texas governor has ordered an investigation into Planned Parenthood and recently a hearing on the matter was conducted in the state. 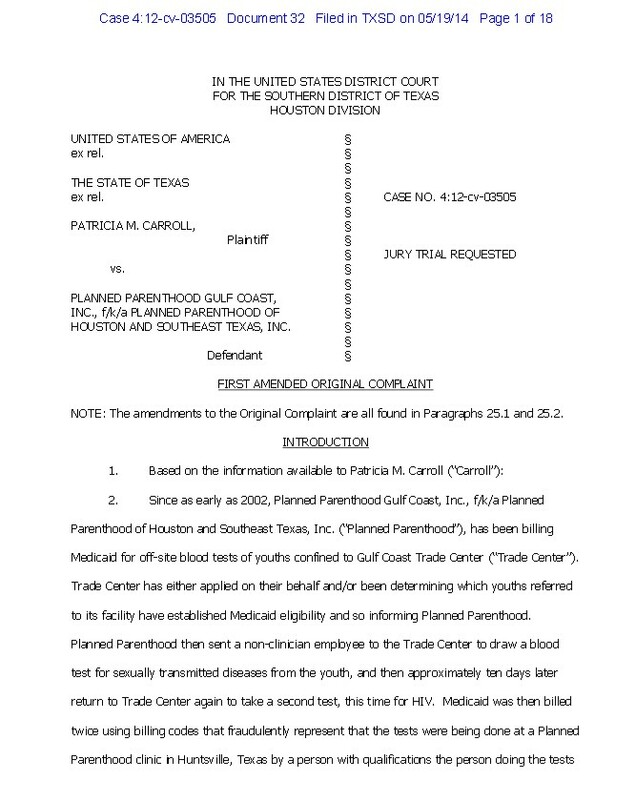 In 2013, Life Dynamics interviewed former employees from a Houston abortion facility unrelated to Planned Parenthood. The abortion workers claimed the doctor would sometimes abort babies that would come out alive. 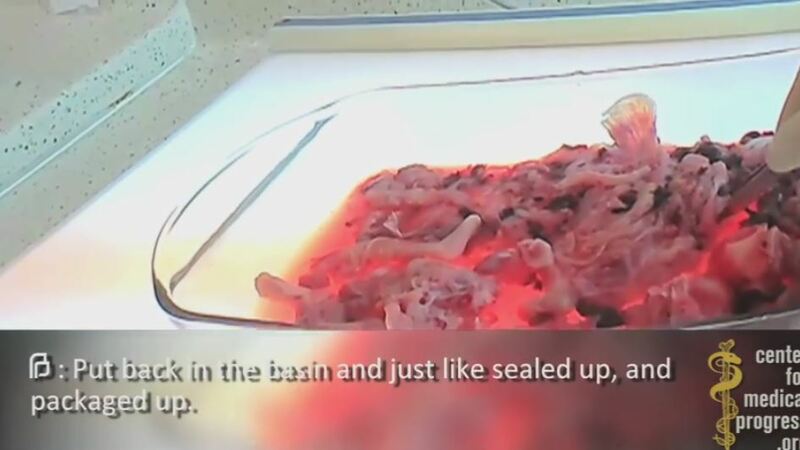 In the Center for Medical Progress video, CMP “buyers” are taken into Planned Parenthood’s back pathology room where they ask to view any fresh specimens i.e. aborted babies. 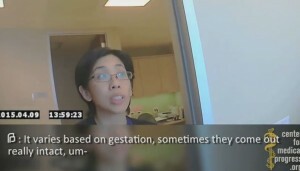 With a BIG smile on her face, the Planned Parenthood assistant says, “We had a really long day and they are all mixed up in a bag,” she states as she giggles. They tell CMP that they keep the “specimens” frozen. Stating they get “40 to 50 easy” babies per month that are 16-22 weeks. 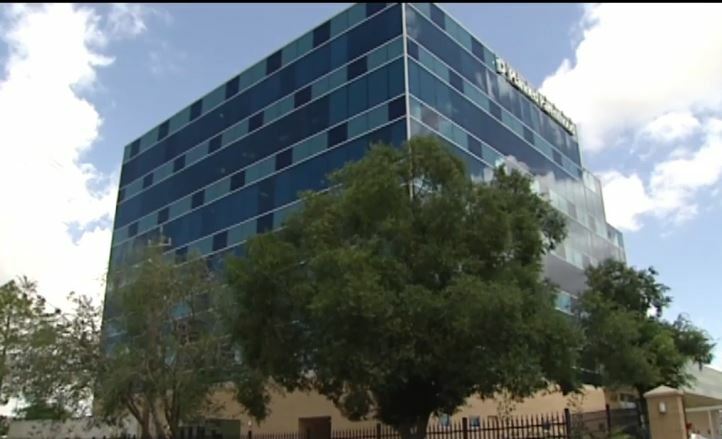 In addition, the employees discuss how Planned Parenthood Federation of America is “moving away from a standardized policy” regarding fetal tissue donation because PPFA is, “encouraging more participation but they don’t want to get too into the mix of it,” they say. Earlier this week, a vote in the Senate to defund Planned Parenthood failed to reach the needed 60 votes to move the bill forward. 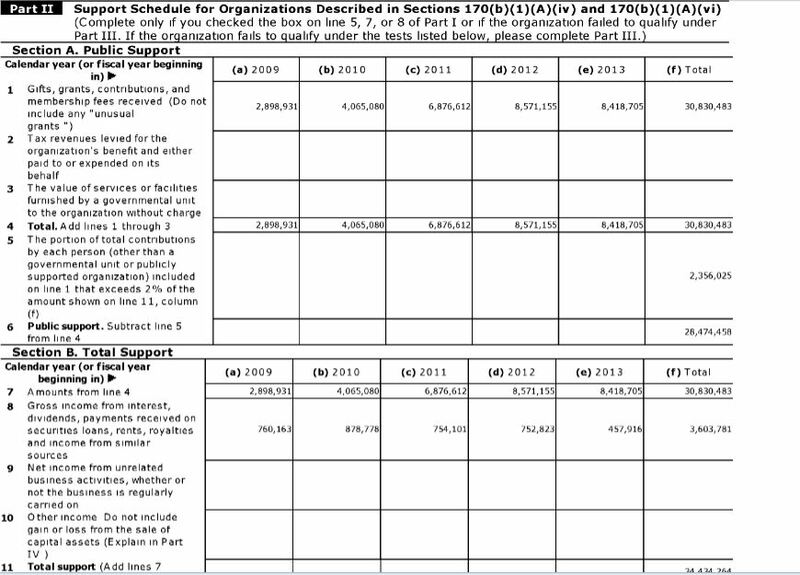 The abortion baby parts business receives half a billion dollars in federal tax money each year. You can view how your Senator voted here. 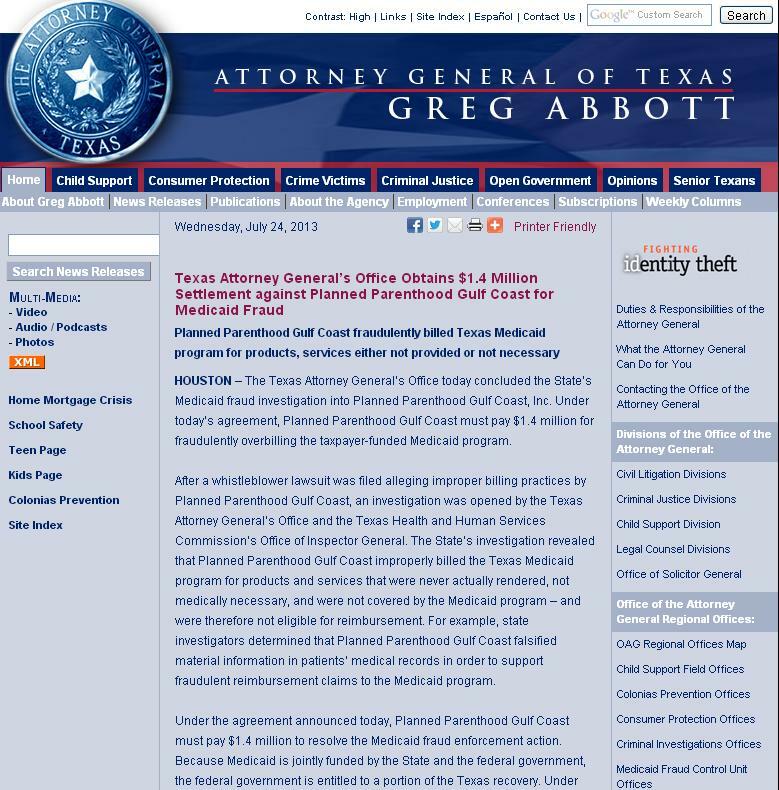 Planned Parenthood fined TRIPLE what AG reported for medicaid fraud ! 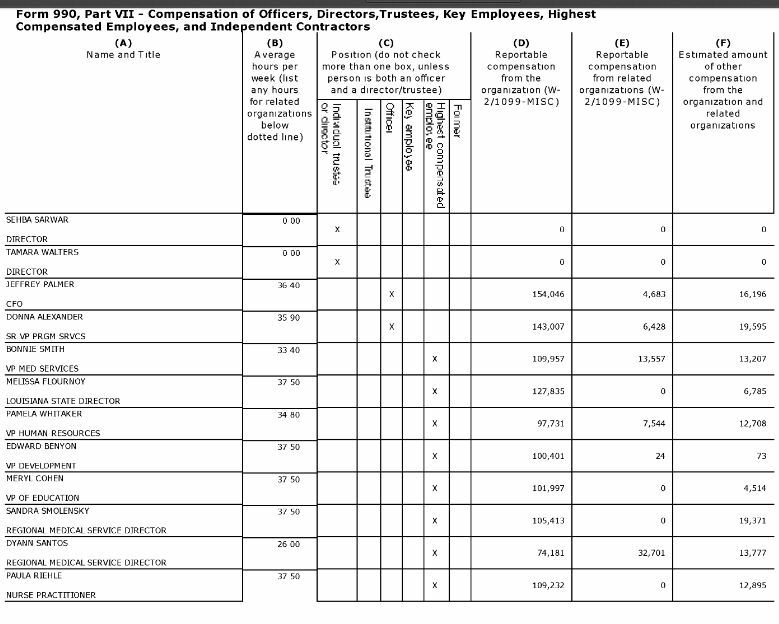 $4.3 million !